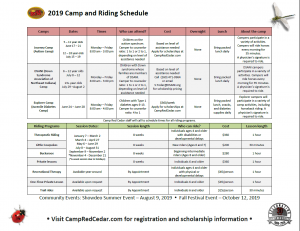 Adventure Camp – For campers with disabilities ages 6-21. Monday – Friday, 8AM – 3PM; Cost for Private Pay Individuals,Cost is based on level of assistance needed, Medicaid waiver accepted, scholarships available (optional overnight on Thursday – additional $50); 1:1 or 1:2 counselor to camper ratio. Please bring a packed lunch daily. Quest Day Camp – For campers with disabilities ages 18 and older. Monday – Friday, 8AM – 3PM; Cost is based on level of assistance needed, Medicaid waiver accepted, scholarships available ; 1:1 or 1:2 counselor to camper ratio. Please bring a packed lunch each day. Quest Retreat Camp – For campers with disabilities ages 18 and older. Drop-off Monday at 8AM, Pick-up Friday at 1PM; Cost is based on level of assistance needed, Medicaid waiver accepted, scholarships available ; meals provided with dietary needs met as best as possible; 1:1 or 1:2 counselor to camper ratio. Discovery Kids Camp – For campers without disabilities ages 6-12. Monday – Friday, 8AM – 4PM; $175/week (optional overnight on Thursday – additional $50, must be eight years or older); 1:8 counselor to camper ratio. Please bring a packed lunch each day. *After camp care from 4:00PM – 5:30PM is provided for an additional cost of $50/week. 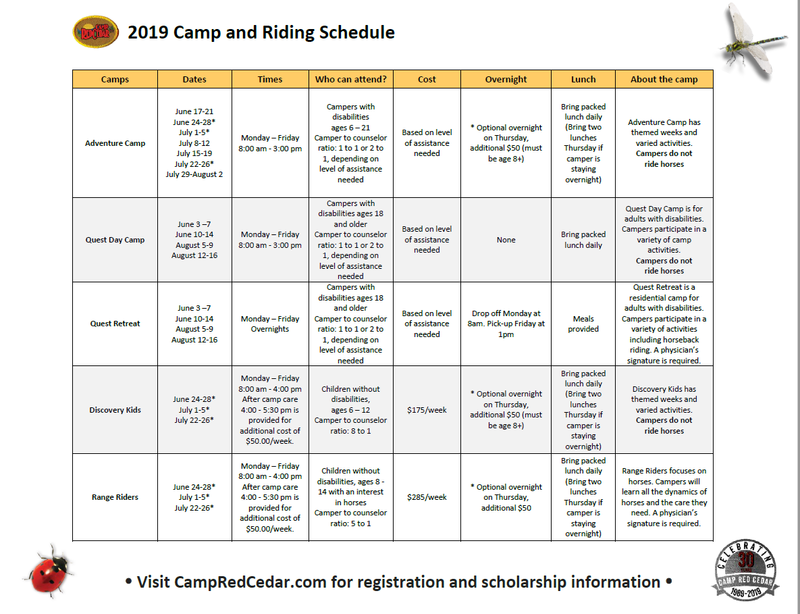 Range Riders Camp – Horse camp for campers without disabilities ages 8-15. Monday – Friday, 8AM – 4PM; $285/week (optional overnight on Thursday – additional $50); 1:5 counselor to camper ratio. Please bring a packed lunch each day. 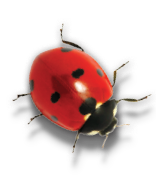 Journey Camp (Formerly known as ACT Camp) – For campers on the autism spectrum. Monday – Friday, 8AM – 3PM; Cost is based on level of assistance needed, Medicaid waiver accepted, scholarships available ; 1:1 or 1:2 counselor to camper ratio. Please bring a packed lunch each day. DSANI (Down Syndrome Association of Northeast Indiana) Camp – For campers with Down syndrome whose families are members of DSANI. 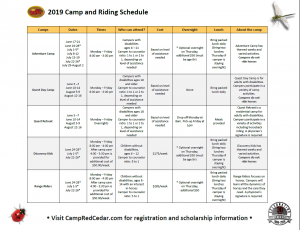 Monday – Friday, 8AM – 3PM; Cost is based on level of assistance needed, Medicaid waiver accepted, scholarships available (see below for contact info); 1:1 or 1:2 counselor to camper ratio. Please bring a packed lunch each day. Contact for pricing and member verification: call 260.471.9964 or email s.yoder@DSANI.org. Explorer Camp (Juvenile Diabetes Camp) – For campers with Type 1 diabetes, ages 6-13. Monday – Friday, 8AM – 4PM (Optional late evening until 8PM on Thursday); $360/week; 1:4 counselor to camper ratio, scholarships available . Registered nurse on-site during all camp hours. Please bring a packed lunch and snacks daily. June 28-Optional Late Night (Includes dinner, guest speaker, camp fire and much more) All cost incurred will be paid for through a generous donation from AWS Foundation and DeKalb Health (Hospital). 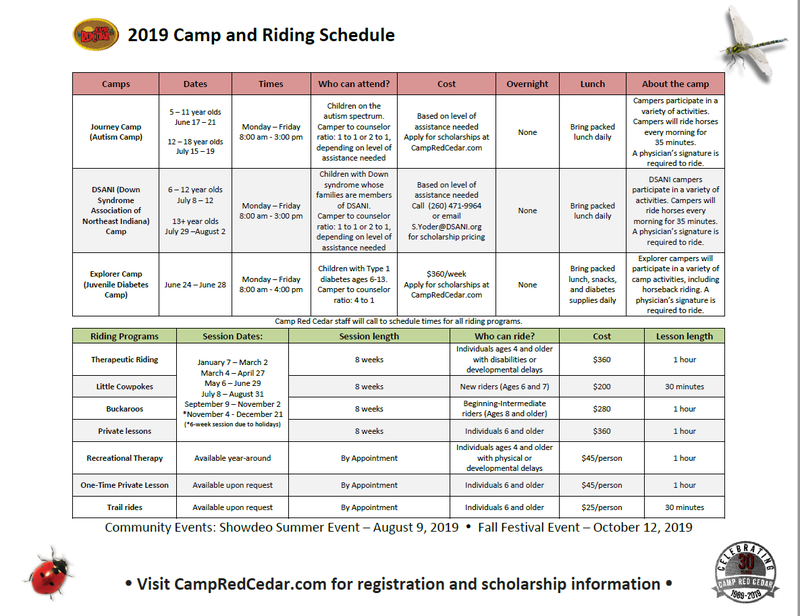 Please contact Camp Red Cedar for available funding for 2019. Click here to signup for camp today.